One of my favorite childhood memories is baking with my mom. It's always been a source of comfort to her to bake things, and I've always enjoyed the chance to help. We got out all the ingredients to make daddy's favorite cookies! Although Grace can't help me bake the way I helped my mom, we still give her the chance to bake with us! This weekend is the annual bazaar and bake sale, which benefits our church, and we always sign up to bake cookies. Last year, Grace and I baked our cookies at mom's house, and Grace was the special sprinkle helper. 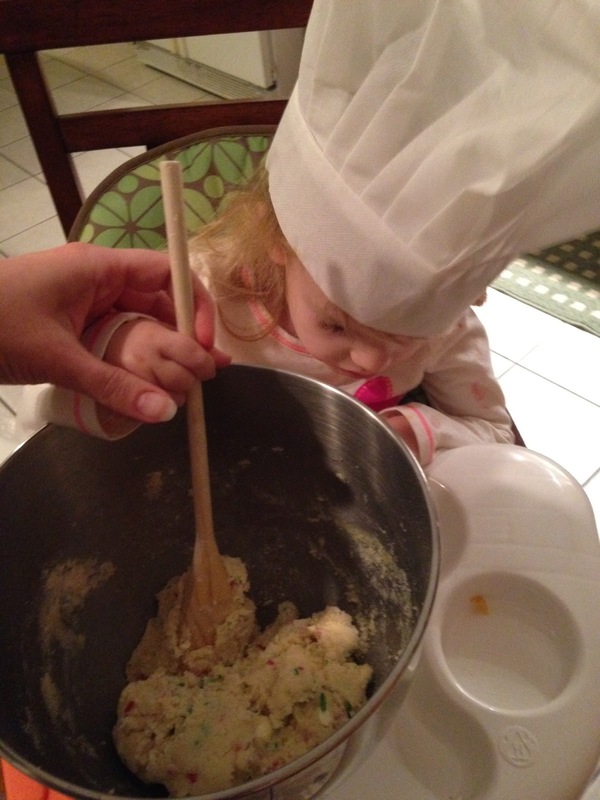 Grace entertained daddy while mommy mixed the dough. 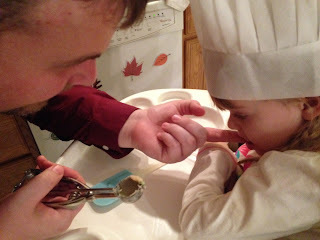 This year, daddy joined in the action, and the three of us took over the kitchen on Thursday night. 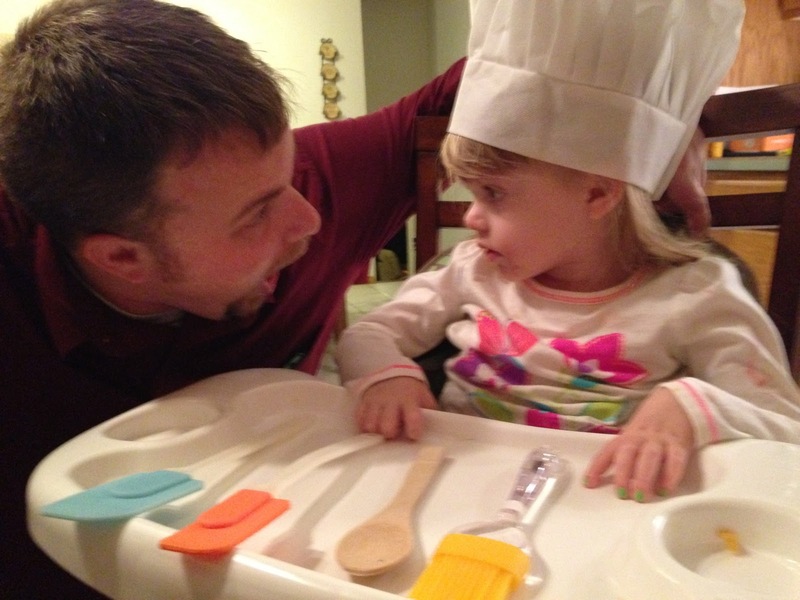 Kyle found some Christmas music on Spotify, and we set Grace up in her booster seat with a chef's hat. Kyle wanted to make his favorite, Funfetti with icing, and I wanted to make my specialty, chocolate chip. So, we opted for both! We started with Funfetti, and I got out all the ingredients and set them on Grace's tray so she could see what we needed to get going. 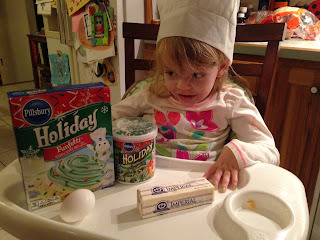 Since the Funfetti are a cake-mix cookie, they only required one egg and some butter. Once we had everything gathered, it was time to start the real fun! This one is my favorite! She couldn't wait until we baked them! I put all the ingredients in my awesome Kitchenaid stand mixer that we got for a wedding present. It's still one of my favorite gifts ever! After the dough was mixed, I put the bowl on Grace's tray and let her help me stir a little. 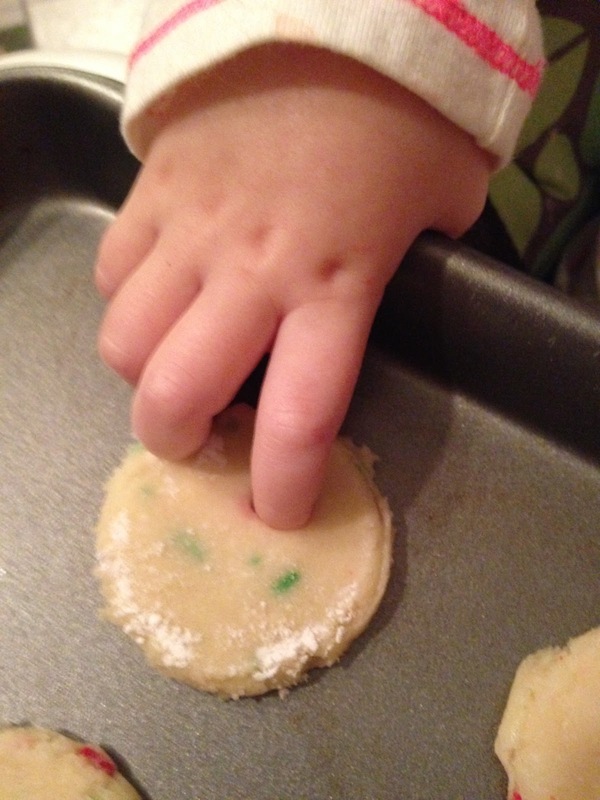 Then she helped me flatten the cookies on the cookie sheet. And of course, we all tried a little cookie dough! Tasting the cookie dough is the best part! We kept a close eye on the cookies while they baked, and then let them cool before icing them. I added the green icing and Kyle and Grace added the sprinkles together. She giggled as the two decorated the cookies, and Kyle helped her enjoy one of the first cookies they finished too! Daddy added his own special sprinkle. 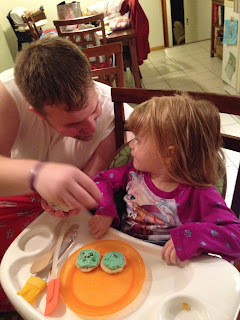 . .
After finishing the Funfetti cookies, Kyle gave Grace a bath, and I mixed up some chocolate chip cookies. 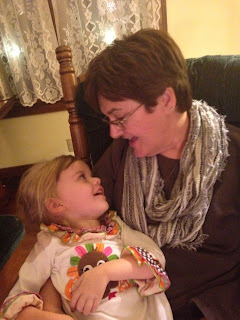 We put Grace back in her chair for a chance to watch as we finished up. Then after Grace went to bed, Kyle and I packaged them together for the bake sale. We ended up with 17 bags of 1/2 dozen cookies, and we were excited to bring them to the bake sale today. Even better, they were almost all gone by the end of the day, and I'm sure the rest will be sold at tomorrow's event. 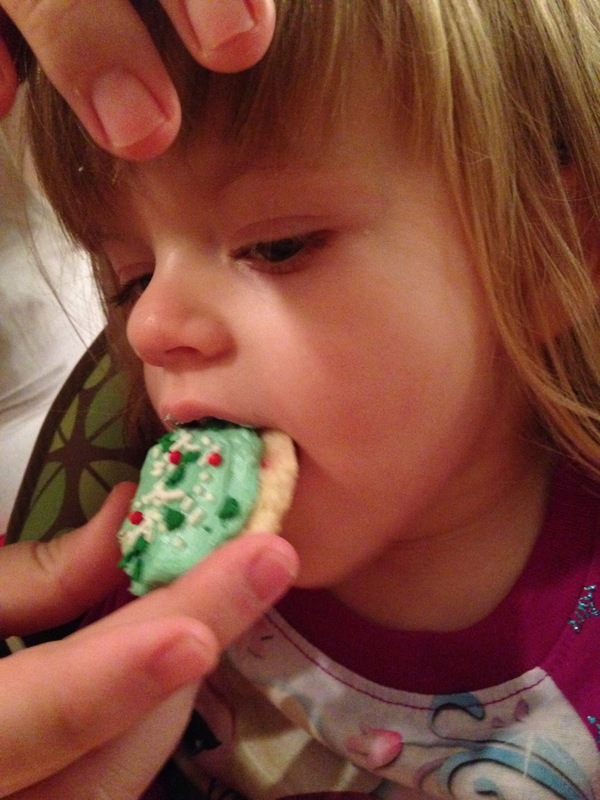 Grace was the official cookie taste-tester! Sometimes, it's really hard for me not to be able to pass along some of my favorite childhood memories to Grace. But I feel blessed to be able to make new memories with Grace. With that beautiful smile and giggle, I know these will be memories I will remember forever. For the past eight years, our church has participated in the Operation Christmas Child program, which is part of the Samaritan's Purse organization. The premise is that shoeboxes are packed full of items, like small toys, candy, hygiene items, stuffed animals, dolls and other things that might make a child happy for Christmas. This is my favorite photo from when we packed shoeboxes! And for the last three years, Gracie Lou has gotten to help pack the shoeboxes. The church collects items throughout the year and then selects a Sunday in November to pack the shoeboxes. When they started, the church filled six or eight shoeboxes, and this year, they filled 150. Once the boxes are filled, they are sent to a central location and then mailed to children in need all over the world. For some children, that small shoebox full of items may be the only gift they receive. When we arrived at the church this year, the organizers had set aside several boxes for her to fill for two to five-year-old girls. I put her in her stroller, and she and I went through the items every time. Each box got a package of soap and a washcloth, a toothbrush and toothpaste, a handmade hat, pencils, activity book, rubber duck, doll, candy and a Beanie Baby. 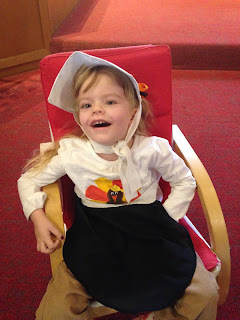 Grace really liked helping to pack the handmade hats! Last year, Grace was able to help pick some of the items. This year, she just held the box on her lap, while I packed it for her. I wish she understood exactly how important what she was doing is for these children and their families. Grace is a sweet girl, and I know she'd have a generous heart too. She may not understand, but I feel blessed that we can be a part of the program. The very last box we filled was extra special. 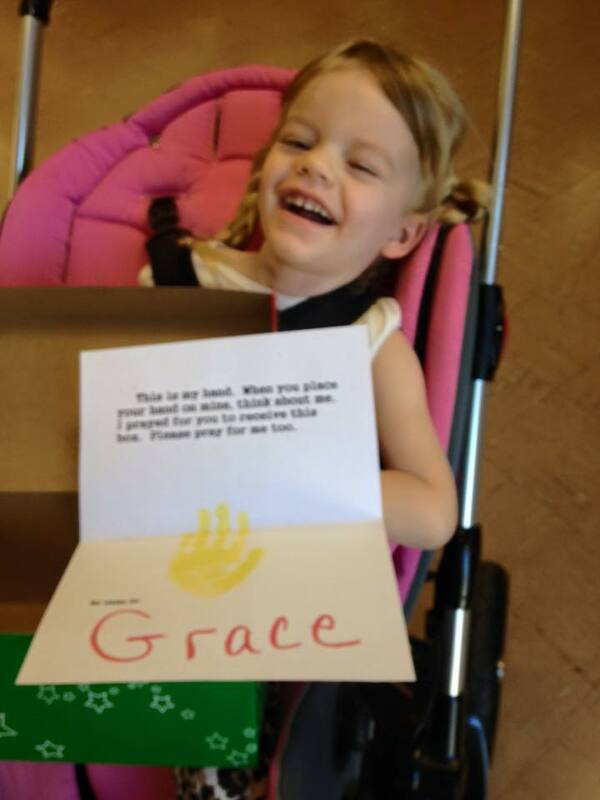 Grace's preschool class also helped with the boxes by creating a handprint with a poem that reads "This is my hand. When you place your hand on mine, think about me. I prayed for you to receive this box. Please pray for me too." 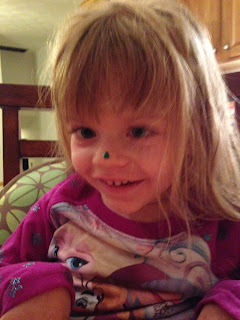 Grace and I say a bedtime prayer together every night, and it warms my heart to know that a child somewhere around the world, may be praying for her too. When I opened up the last box, which was not one the organizers had set aside for her, I teared up a little to find a little yellow handprint and the name, Grace. Grace and all the kids did a great job packing shoeboxes! Although Grace doesn't understand much about presents or giving or helping those less fortunate, I know that she enjoys being part of it. We are planning to pick out an angel from the Angel Tree this year too and taking Grace shopping with us. And the smile she gives us will be present enough for everyone. We continue to be blessed (over and over again) but the generosity and the love our community has to offer. Tonight at the paper, some kind soul left an anonymous card in the front door with a dining out gift certificate, a massage gift certificate and three smooth stones with the words "Grace" "Faith" and "Expect a Miracle." We are so truly humbled by the outpouring of love from our family and the unending support of our friends. 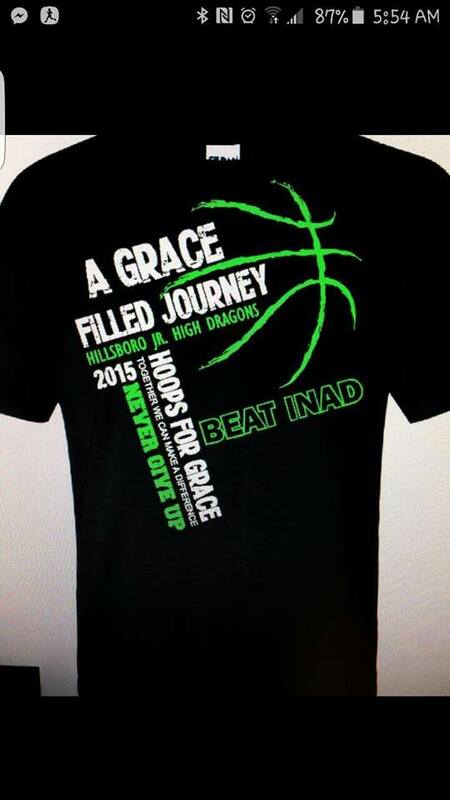 Earlier this fall, I got a message on Facebook from Jessica Furness asking if the Hillsboro Junior High School boys and girls basketball teams could do a T-shirt fundraiser for Grace. I agreed, and then didn't think much else about it. 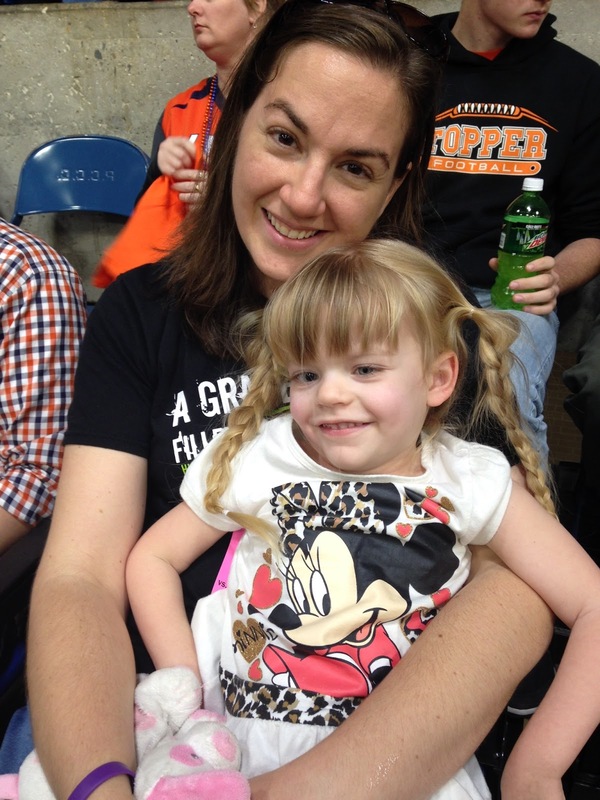 Cheering for the Dragons and Hoops for Grace! Until a few weeks ago when a photo of the new shirts popped up on my Facebook wall. In black and green, they were really sharp, with our new favorite phrase, "Beat INAD." I couldn't wait to get one, and I was even more excited to find out they came in the hoodie variety too! We got our orders in and were all set to go to both a boys and a girls basketball game this week. Check out the awesome new Grace shirts! 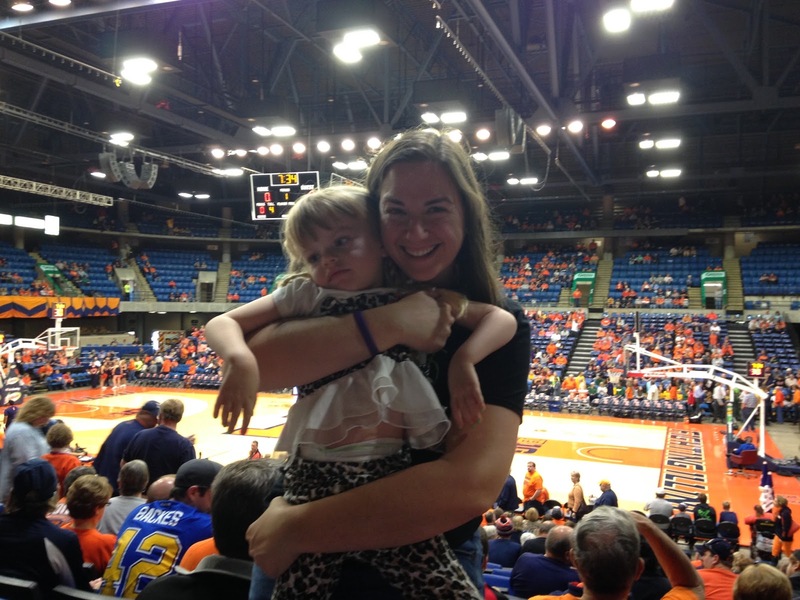 On Monday night, when the girls played, Aunt Mikaela brought cousin Quincy down for the game, and Grandma Kim joined us too. We had fun in the stands (once Quincy decided it was okay for people to cheer). I got Quincy snuggles, and Grace loved snugging with Aunt Mikaela. 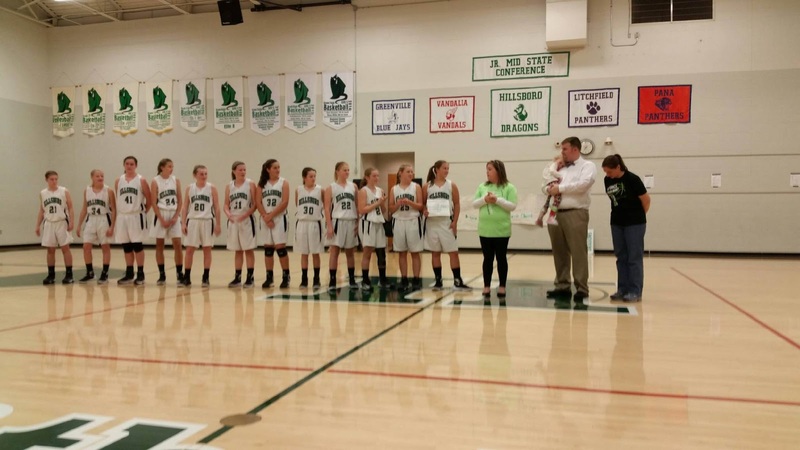 Between the seventh and eighth grade games, they invited us down to the floor with the eighth grade girls team. They gave us a check for $650 from their team's challenge, and we promised to come back on Tuesday night for the boys game. Hanging out with Quincy and Aunt Mikaela at the game! Since Kyle had to go to a City Council meeting, Grace and I went to the game with Grandpa John, who took photos for us. It was another couple of fun games. This time, between games, the Assistant Principal gave us a check for $800 from the boys' teams, who ended up winning the fundraising challenge. 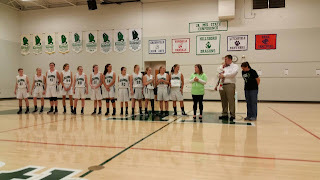 The eighth grade girls presenting their check for the fundraiser. On Friday, the boys will be treated to a pizza and ice cream party after basketball practice for their hard work. We were delighted they invited us as well, but we already have tickets to a soccer game in St. Louis, so we hope they will have an extra slice for us. Assistant Principal Don VanGiesen presented us with a check from the boys teams. And though the boys team came out on top in the challenge, the real winner is the INAD research study at Washington University. We can't wait to take our BIG donation to the school in December. Keep posted for an update. You won't want to miss how much you guys have raised since the beginning of the year. We love each and every one of you, and we couldn't do it without you. #BeatINAD. Another of our favorite holidays has come and gone for the year, and this year, we celebrated Halloween in style! Kyle and I decided several months ago that Grace would be Queen Elsa from Disney's Frozen. She got the costume last year for Christmas from my parents to wear when we saw Frozen on Ice in February. Halloween seemed like the perfect opportunity to get some more use from the costume. Since Grace wouldn't be able to walk for trick-or-treating, Kyle and I decided we would somehow transform her stroller into an ice castle. We had talked about it for weeks, but didn't really get around to working on it until Halloween week rolled around. Because that's how we roll. With a big cardboard box, two cans of light blue spray paint and some pictures from the internet, I set about creating Grace's ice castle. Okay, so I actually only bought one can of spray paint the first time, and had to go back and get another one. But it worked, and with a little glitter, it really sparkled. Hanging out with Cousin Izzy and Keith while waiting for the parade to start. Our first Halloween outing was with Grace's preschool class. She and her classmates walked from the school to the newspaper office, up Main Street and back to school for a Halloween party. The kids even got a ton of fun treats! Cheesing with Grandma and Grandpa Galer at the paper. The next marked the annual Trick-or-Treat Trail with area businesses followed by the Hillsboro Rotary Club Halloween parade. For the Trick-or-Treat Trail, more than 30 businesses open their doors to trick-or-treaters and those who participate have a chance to win prizes. We opted just to pick a few places to stop, including the newspaper office and RehabEdge, where Grace has physical therapy each week. Mom and I also took her to get her photo taken with Ken Meade and his neat Halloween set. She won first prize in her age group! Then it was time for the parade. Kids line up in different age groups, and the costumes are judged by local volunteers. We participate just for fun every year, and this year, Grace won first place in her age division. Although I might be biased, she did look beautiful. We intended to do a bit of trick-or-treating in Hillsboro that night, but Grace was a bit under the weather, so we decided just to eat dinner with Grandma and Grandpa and call it a night. Grace held the candy bucket for trick-or-treaters and Kyle showed off our pumpkins. 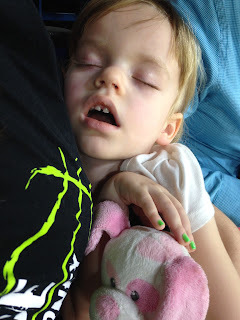 Grace then proceeded to sleep nearly all day on Saturday as she tried to fight off her cold. We did wake her up that evening to greet trick-or-treaters at our house and so we could carve pumpkins. I used a stencil to create Mike Wazowski from Monsters Inc., and Kyle carved the words "BEAT INAD" out of his pumpkin. Pumpkin carving is always one of our favorite traditions, and even though we didn't get to do it until Halloween night this year, we will really enjoyed it. Grace liked helping to pass out candy to the trick-or-treaters that came by. The following day, we had planned to trick-or-treat with some of Kyle's family in Raymond, but Grace just wasn't feeling up to it. So we promised to visit again sometime soon. Halloween ends up being a pretty busy holiday for us, but we enjoy the chance to make memories together as a family. And I think Kyle's already planning his pumpkin for next year. "I run today for Grace. And one day I know she'll run by my side." It's just been just over a year since my brother sent me that text message. 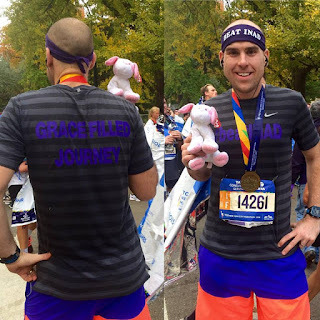 Last October, he ran his first marathon, the Marine Corps Marathon in Washington DC, in honor of Grace. It was part of the 1,000 miles he pledged to run for her that year. Today, he finished his second marathon for her, this time in New York City. I'm so proud that he not only finished the 26.2 mile course in three hours and 33 seconds, but that he also helped to raise awareness for all the kids battling INAD. Running has just never been my thing. So, I truly admire those that run and train all the time for different events. From 5K races to 26.2 mile marathons, it takes a lot to get up off the couch and get moving. And it's even more inspiring to see people run for Grace. Earlier this year, when they were planning the Grace Filled 5K event, Johnny posted this quote to Facebook. "I run because I can. When I get tired, I remember those who can't run, what they'd give to have this simple gift I take for granted, and I run harder for them. I know they would do the same for me." Johnny, and his wife Emily too, started running for Grace before we even knew INAD existed. They are a constant source of courage and inspiration to me through their efforts to raise awareness and funding for INAD. Emily took these photos of Johnny along the course. Their first race this year was the Cherry Blossom 10-mile in Washington DC. In celebration of Grace's favorite stuffed puppy named Bruce, they purchased a Bruce replica and have been running with him ever since. After the 10K, they ran a 200-mile marathon relay from Gettysburg, PA to Washington DC with a 12-member team. Each friend lovingly carried Bruce along the route in honor of Grace. And although they didn't actually run in the race, they organized the Grace Filled 5K event, which drew more than 700 runners and walkers all over the world. They aren't the only ones to run for Grace either. 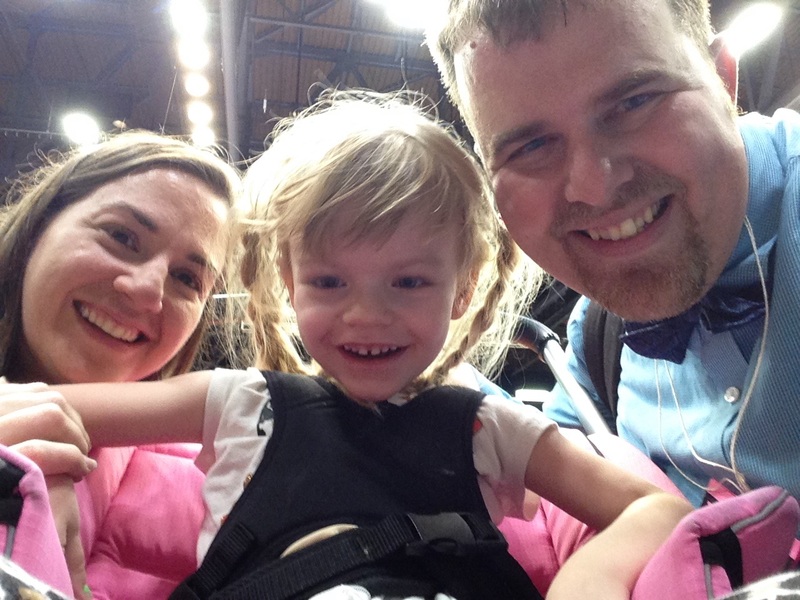 This spring, Kyle's high school friend, Kendal Elvidge and his family ran a marathon-relay in Champaign for Grace. And Kyle's Aunt Kim ran an Ironman course this summer. After the race she posted a photo of her medal and her Gracelet, and said Grace had really been an inspiration for her the entire route. In December, a group of local runners is also doing a marathon relay for St. Jude, and they chose the name "Grace-ful Runners" in honor of Grace. That's one special little girl making a huge difference. 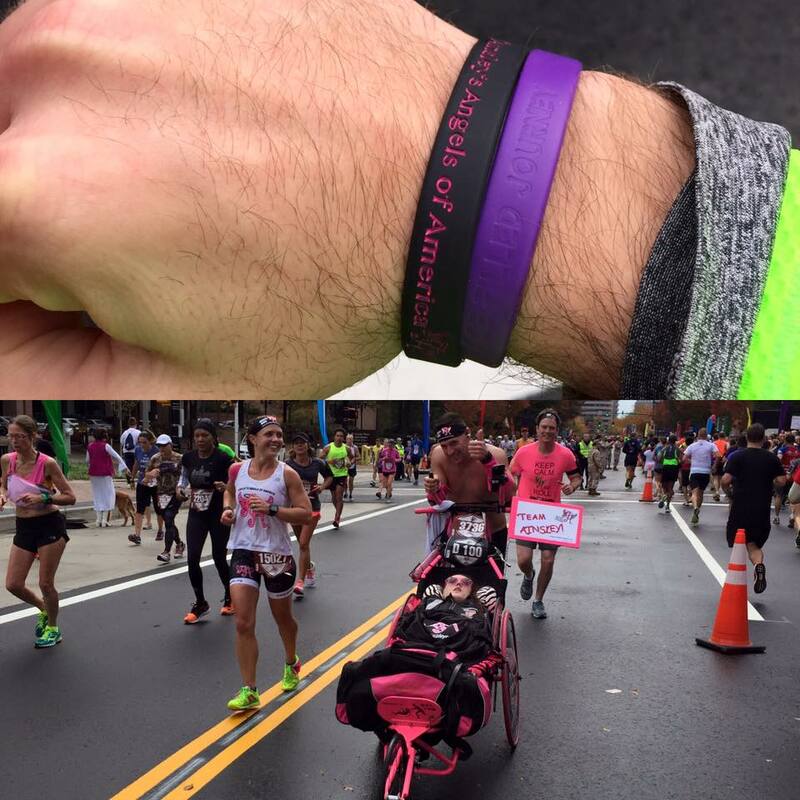 These photos are from the Marine Corps Marathon when Johnny went to cheer on Ainsley and her dad. Last week, it was once again time for the Marine Corps marathon. As Johnny was running the course last year, he saw a sticker on a racing chair that caught his attention. After the race, he googled the logo, which turned out to be Ainsley's Angels of America, named in honor of Ainsley Rossiter, who like Grace, suffers from INAD. Her foundation was started to provide race chairs to give those who are unable to physically run a chance to participate in races. I got to share our story with Ainsley's mom and dad after we learned that Grace also had INAD. Although Johnny didn't run the Marine Corps marathon this year, he did make his way to the course to cheer for some of the racers. This year, Ainsley's dad, who himself is a Marine, pushed Ainsley through the 26.2 mile course in what would be her 100th race as a captain. As they passed by where Johnny was standing, her dad came over to give Johnny a hug and gave him the bracelet off his wrist. I know it was a moment Johnny will always remember. Just one week later, it was time for Johnny's marathon, the 26.2 mile course through five boroughs in New York City, ending in Central Park on Nov. 1. He texted me earlier this year and said he put his name in the lottery on a whim. 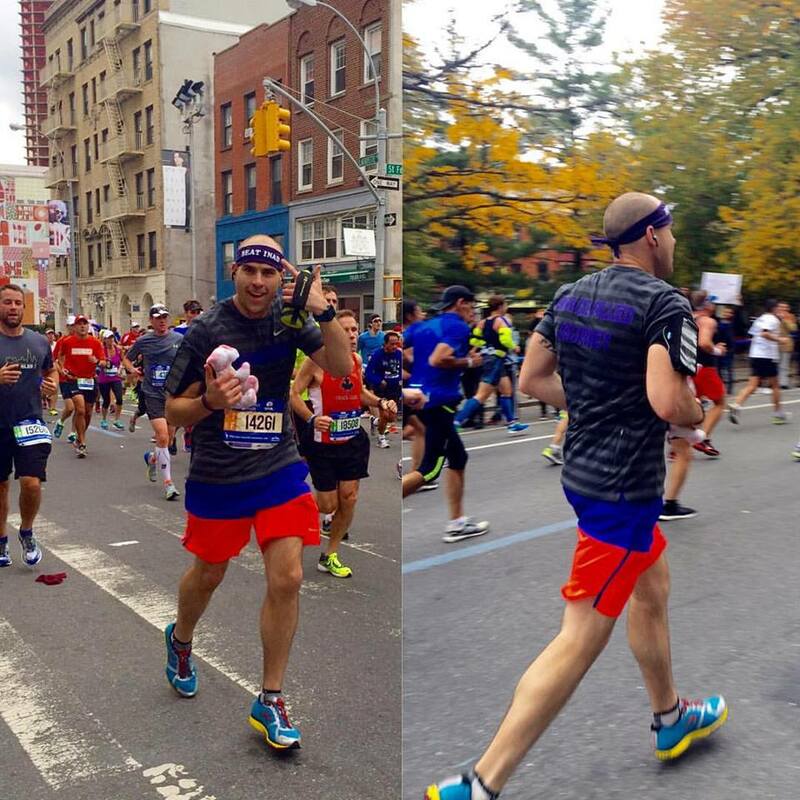 His name was selected, and he joined 50,000 other runners in the streets of New York City. Of course, Bruce came along for the ride. Johnny carried him the entire length of the marathon. He also had a custom made #beatINAD shirt and headband to help raise awareness for this very rare disease. My sister-in-law sent periodic updates throughout the race on his progress, and my dad watched the route on his cell phone. I would have loved to have been there in person, but it just didn't work out. Grace and I made a sign to wish Johnny good luck on his race. "A Grace-Filled Journey carried me through 5 boroughs and 26.2 miles in NYC for the #‎TSCNYCMarathon. There are too many people to thank for the coaching, motivation and inspiration, but you know who you are and your efforts helped me more than you'll ever know. 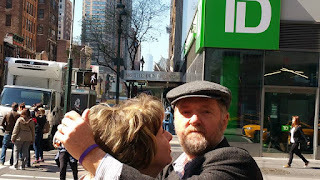 The race is over, but the battle against INAD isn't. A marathon pales in comparison to the struggles Grace and a handful of other kids and their families battle every day. 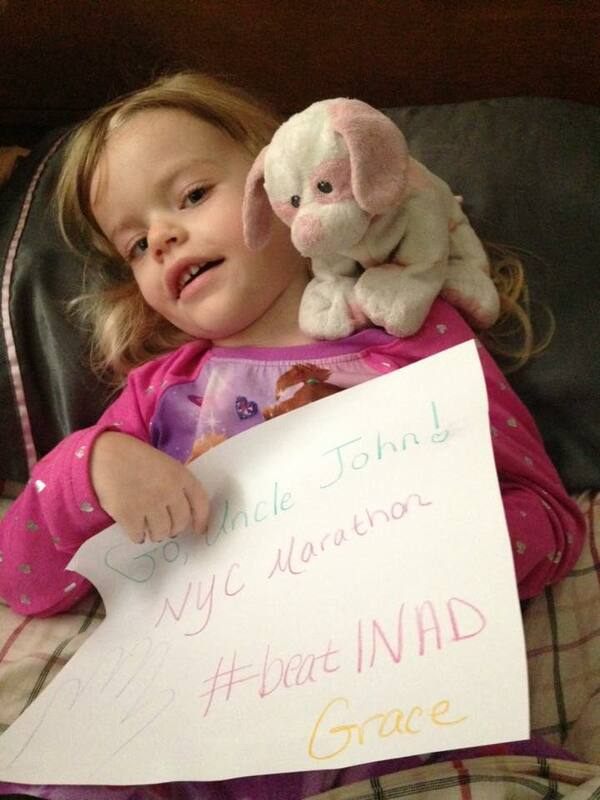 We must keep pushing and find a way to #‎beatINAD!" I am so proud that our family and friends have taken up this cause in so many ways in Grace's honor. There are many times I struggle because my dreams for Grace may never come true. I listen to people talk about how their kids will be great athletes or straight-A students, and most days, I wish Grace would be able to tell me what she did in school that day. But that's my struggle, not hers. She makes her own path and changes the world in ways I could never even imagine. Although Grace may never get to run by her Uncle Johnny's side, I know she makes a difference in so many lives each and every day. She teaches empathy, compassion, kindness and the importance of living every day to its fullest. And her beautiful smile shows that no matter what the future holds, the present is full of sunshine. And for that, I will always be grateful.